TORONTO, ON--(Marketwired - May 31, 2017) - Wesdome Gold Mines Ltd. (TSX: WDO) ("Wesdome" or the "Company") is pleased to announce initial development results from its new 300E Zone located at the Company's Eagle River Mine near Wawa, Ontario. 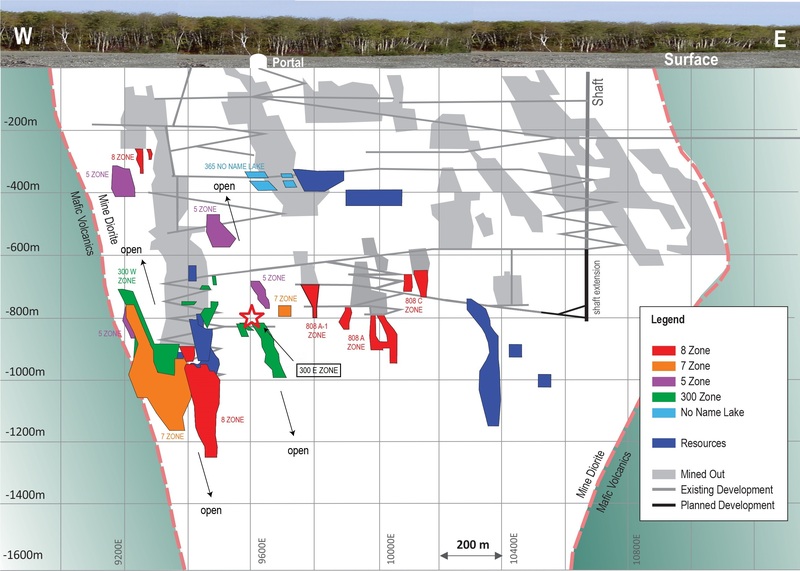 Development completed in 2016 provided access to drill and develop this discovery, initially announced in a Press Release dated November 30, 2015 (www.wesdome.com) with subsequent diamond drill results announced on January 26, 2017. To date, diamond drilling has traced the structure from 750 metre depth to 1,000 metre depth, and remains open in both directions. 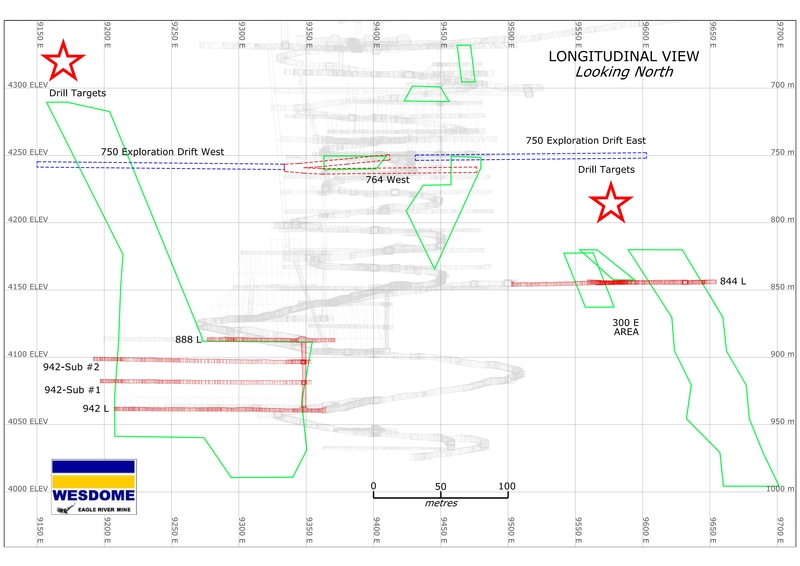 Development on the 844 metre level was completed in May on the 300E Zone where drifting results have confirmed continuity and strong grades, and the existence of a new and significant production area for the Eagle River Mine. The 300 Zone is a recently recognized structure located 300-400 metres north of the main 8 Zone structure, which has provided the bulk of the Eagle River Mine's production over the last twenty years. It consists of two areas, 300W and 300E (see Figure 1). The 300W area is typified by a steeply dipping, tabular, shear hosted quartz vein. The 300E area consists of a series of tabular to pipe-like quartz vein systems with strong folding leading to localized widths and grades that are wider as well as higher in grade (303 Lens). 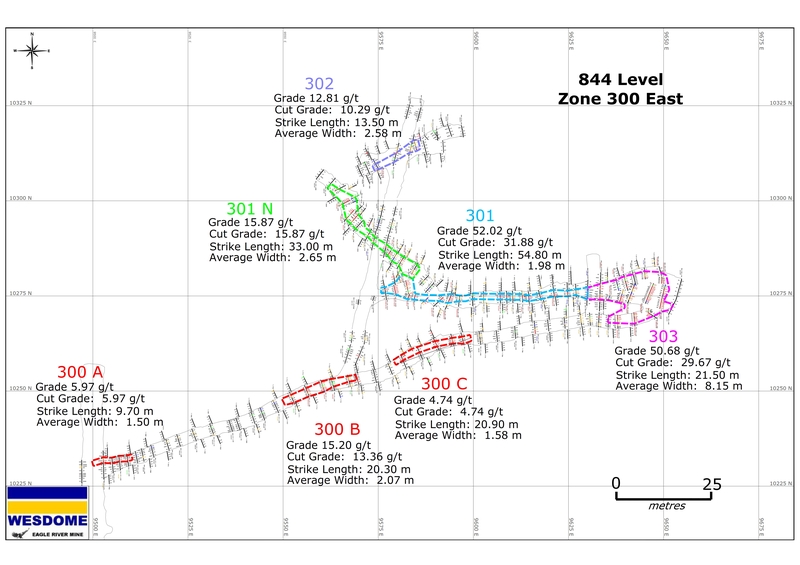 Development to date has identified the following subzones on the 844 metre level (see Figure 2). The combined strike length of the subzones is 173.70m with a weighted average width of 2.85 m and cut and uncut gold grades of 22.62 g Au/tonne and 34.79 g Au/tonne, respectively. Mr. Duncan Middlemiss, President and CEO commented, "This initial development has added to our understanding of the significance of the wide and rich intercepts released on January 26, 2017. We are developing a new production area for the mine that displays above historic average widths and grades. Recent successes in the 300E, 300W and 7 Zones bode well for increasing the average grades of our mineral reserves and our near term annual production profiles. We expect to see production ore from the 300E Zone by the end of this year, but the longer term implications are to continue our mine wide exploration program keying in on the potential extensions of all of these zones along strike." All assays are performed by fire assay on 25 gram aliquots at the Eagle River Mine assay office. Duplicates, replicates and blanks are routinely employed to monitor quality control. The technical content of this release has been compiled, reviewed and approved by Philip Ng, P.Eng, Chief Operating Officer of the Company and a "Qualified Person" as defined in National Instrument 43-101 -Standards of Disclosure for Mineral Projects. Wesdome Gold Mines is in its 31st year of continuous gold mining operations in Canada. The Company is 100% Canadian focused with a pipeline of projects in various stages of development. The Eagle River Complex near Wawa, Ontario is currently producing gold from two mines, the Eagle River Underground Mine and the Mishi Open pit, from a central mill. Wesdome is actively exploring its brownfields asset, the Kiena Complex in Val d'Or, Quebec. The Kiena Complex is a fully permitted former mine with a 930 metre shaft and 2,000 tonne per day mill. The Company has further upside at its Moss Lake gold deposit, located 100 kilometres west of Thunder Bay, Ontario, which is being explored and evaluated to be developed in the appropriate gold price environment. The Company has approximately 133 million shares issued and outstanding and trades on the Toronto Stock Exchange under the symbol "WDO."